Regular readers of this blog know I'm a morning news anchor at a TV station in southern Illinois. Earlier this morning I took a phone call that has weighed on my mind ever since. The woman on the other end was a viewer and we have a few mutual friends. She's on the board for a group called Granted. 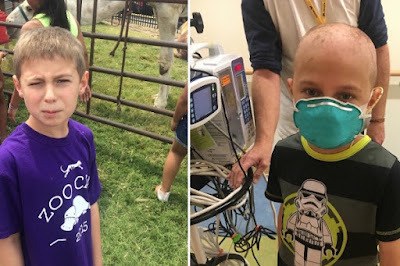 Their mission is to grant once in a lifetime wishes to children in southern Indiana, southeastern Illinois and western Kentucky who have been diagnosed with a life-threatening or terminal illness. The woman told me the story of Dalton. (His family has a GoFund Me page where you can learn more about him.) He just turned 11 and is fighting for his life. Dalton has Adrenoleukodystrophy or ALD, which is a deadly genetic disease. He's a big wrestling fan and his wish was to attend WrestleMania 33 in Orlando in April. However, Dalton's time is precious and the trip is not likely to happen. So that's where I come in. Through my work with different wrestling groups and my podcast and blog, I've made a lot of friends in the business. Already many of those friends are working to get autographed photos, action figures and other memorabilia to Dalton. I'm also trying to organize a visit by indy wrestlers, legends and perhaps even a WWE Superstar. That phone call has changed my outlook. If you know a wrestler who is willing to donate an item or if you have something you'd be willing to give, please let me know. My email is kevinhunsperger@gmail.com or hit me up on Facebook or Twitter (@kevinhunsperger). If there happens to be someone within the WWE reading this, please consider sending a Superstar Evansville, Indiana and making this young man's last wish come true. Thank you to everyone who has already committed. In a short amount of time, I've seen the kindness of strangers shine through like never before.